The Square Kilometre Array has reached a number of major milestones in the past few months. July 13, 2018 saw the inauguration of the 64-dish MeerKAT telescope, the precursor to SKA1-Mid, at the SKA site in the Karoo desert region of South Africa. 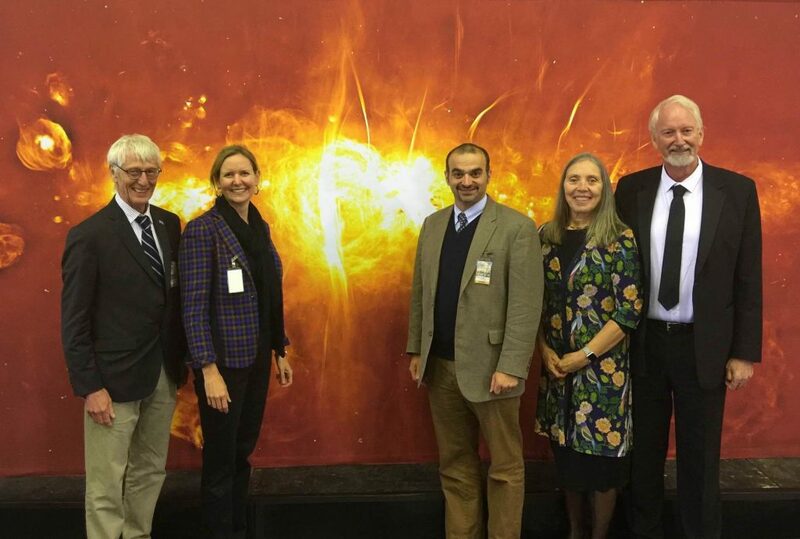 The array was opened by South Africa’s Deputy President, His Excellency The Honourable David Mabuza, and was accompanied by a release of MeerKAT’s stunning new image of the Galactic Centre (see Figure 1). Canada’s SKA Directors Greg Fahlman and Bryan Gaensler and Canadian High Commissioner Her Excellency Sandra McCardell were all in attendance for the celebration. As well as the spectacular MeerKAT array, attendees also viewed the SKA1-Mid prototype dish now under construction at the site. At the other SKA site in Australia, a multi-national team involving the Netherlands, Italy, Malta, UK, China and Australia has now completed a prototype array of SKA1-Low antennas. This 256-element “AAVS1 Test Platform” is now being used to test the antenna technology (see Figure 2). All 36 antennas of the Australian SKA Pathfinder (ASKAP) have now been fitted with phased-array feeds. 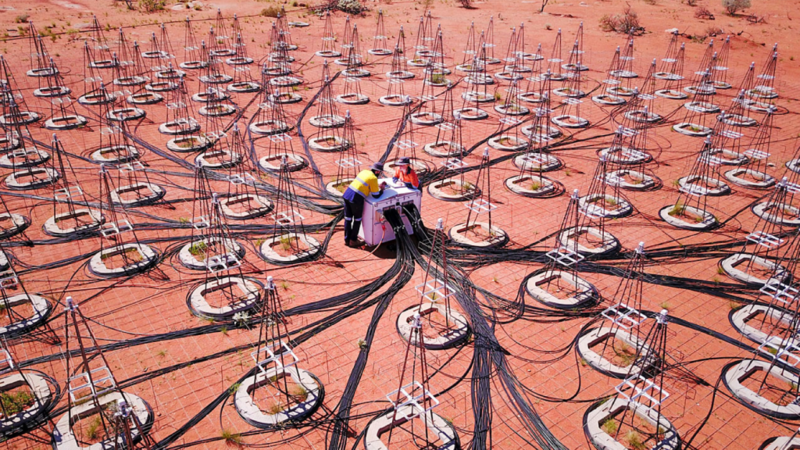 ASKAP commissioning continues towards the delivery of Array Release 3, an 18-antenna array and the commencement of phase two early science observations. A pilot survey program using all 36 antennas is being planned for the first quarter of 2019. The Australian site now has a fully integrated hybrid power station, and is the only major observatory able to run purely on solar power. The SKA now has a nervous system! After four and a half years, the international consortium tasked with designing the crucial software that will control, monitor and operate the SKA telescopes concluded its work. The first of 12 consortia to complete their work package, Telescope Manager was led by India’s National Centre for Radio Astrophysics (NCRA) and comprised nine institutions in seven countries, including Canada’s NRC Herzberg. More countries are signing up to the SKA. In June 2018, Spain become the 11th member of the SKA Organisation, and in July 2018, France became the 12th. Both countries have already contributed greatly to the SKA project through their involvement in the international design consortia and in the SKA’s Science Working Groups. The 27th meeting of the SKA Board of Directors took place over July 11-12, 2018, in Cape Town, South Africa. The Board was updated on progress towards establishing the new Intergovernmental Organisation (IGO). As part of the process to establish the IGO, eight countries have “initialled” the tex of the SKA Convention text, with a formal Ministerial signing ceremony to be scheduled for later this year in Italy. Canada and New Zealand will not be initial signatories to the SKA Convention, but have begun discussions on joining the SKA Observatory as associate members. Discussions in Cape Town also covered progress on SKA design work, plans for the bridging phase (between the end of design and the start of construction), planning for transitioning between the current SKA Organisation and the future SKA Observatory (the new IGO), and the potential role of SKA regional centres. The next such meeting will be an interim Board meeting in September by video, with an in-person meeting scheduled for November 13-14, 2018 at the new SKA Headquarters in Manchester. For further information on international SKA activities, see the latest SKA Newsletter and the bi-monthly SKA Organisation Bulletin. NRC Herzberg continues to be a major participant in pre-construction efforts for the SKA, principally through NRC leadership of the Central Signal Processing (CSP) consortium and their contractor MDA, and also through NRC participation in the DISH and Telescope Manager design work. The CSP consortium is approaching a major milestone in the form of its Element Critical Design Review, to be held at the SKA Project Office on September 25-28, 2018. This will mark the end of nearly six years of development work. The external reviewers for the review will be Jonathan Weintroub (Harvard), Larry D’Addario (JPL/Caltech), Alain Baudry (Université de Bordeaux) and Cees Bassa (ASTRON), in addition to several reviewers from the SKA Organisation. Four of the five CSP sub-elements (PSS, PST, MID.CBF and LOW.CBF) were reviewed back in February and March 2018. All reviews went well, with good discussion and feedback received. There were more than 1900 Observation Action Registers raised. Most were resolved before or during the meetings. Outstanding actions are being worked and tracked. The last sub-element (Local Monitoring & Control) will be reviewed on September 24, 2018. Both reviews will focus on extensive documentation packages submitted by the CSP team. On the technical side, the team recently reworked Pulsar Search (PSS) to include rapid phase change, tested a different 16k channeliser design in MID.CBF for better performance, and continued to integrate the Frequency Slice Processor FPGA design for the correlation function mode with the different 16k channeliser and settings. A critical interface control document that includes important power and cooling specifications has been finalised with the SKA infrastructure team in South Africa, and is now in the signature stage. The Mid-Frequency Single Pixel Feed Receiver/Digitiser design (SPFRx) at NRC has undergone a number of significant changes as a result of discussions on requirements between the SKA Organisation and the CSP and DISH consortia in April 2018. In order to maintain phase coherence during band changes, an individual analogue-to-digital converter will be used for each sampling frequency. The two digital processing cards in the Pedestal Unit will be replaced by a single TALON-DX processing card. This key hardware commonality between SPFRx and MID.CBF will leverage the same development and prototyping efforts for both systems in Penticton. Some re-design work is required and is now underway. A second delta Detailed Design Review is now scheduled for October 2018, and Band 1&2 qualification models will be delivered to South Africa in May 2019. The Band 1&2 Critical Design Review will also be held that month. The Digitiser design team has been expanded to include additional resources in Penticton. This effort fits within the overall DISH consortium work which will conclude in mid- to late-2019. The SKA Science and Engineering Advisory Committee (SEAC) met at the newly-commissioned FAST radio telescope near Guiyang, China, over July, 2-3 2018. In general the SEAC is satisfied with the progress of the project since its last meeting, noting the success of the critical design review process so far, the SKA Organisation’s management of the low-frequency aperture array (LFAA) workpackage, the implementation of the Operations Model Review recommendations and the production of detailed documents regarding global data flow and computational requirements for calibration and archiving as highlights. The SEAC’s recommendations to the SKA Organisation and to the SKA Board were largely accepted, including the development of commissioning software, a technical review of high-performance computing requirements for calibration and archiving, the arbitration of consortia interdependencies, continued LFAA development and resourcing to manage consortia as necessary, and the creation of a reference SKA Regional Centres design. The SKA Organisation has adopted a tiered model for data and science support, similar to that employed by CERN. Storage and computing resources associated with the operational SKA Observatory itself will be highly constrained in order to keep up with SKA operations. Any further processing and subsequent science extraction by users will require significant, outside computing and storage resources in the form of SKA Regional Centres (SRCs). SRC Costing: A revision of the SRC Requirements document was requested to improve the estimates for the global SRC resources necessary to support the science productivity of the facilities. These include storage capacity, processing capacity and types of FTE support. The document must be completed by the beginning of October 2018 for submission to the next meetings of SEAC and the Board. This requirements document with a distribution model are necessary inputs to planning for a Canadian SRC. Governance: In response to a request from the SKA Organisation for a governance model for SRCs, the SRCCG’s position was that the governance model should be developed by the SRC members in collaboration with the SKA Organisation and not by the SRCCG. There are many models of international resource collaborations such as CERN’s WLCG, so this is not seen as a project risk. This issue spurred the need to begin thinking about forming an international SRC collaboration (see next paragraph). In parallel with the SRCCG discussions, a meeting of representatives of potential SRC members was held in August 2018 to discussed to lay out a framework for forming an SKA Regional Centre Organisation. A draft outline of this framework is being drafted; once finalised, it will be distributed to stakeholders in Canada to gather comment before the end of September 2018. All potential member consultations will be merged into an expanded document for the next face-to-face meeting of the SKA Board in November 2018. The Canadian SKA Regional Centre Advisory Committee (CSRCAC) has been working with the NRC to define the scope of a possible Canadian SKA Regional Centre. Regional centres are an integral part of the SKA data ecosystem, and provide the primary point of contact between the SKA Observatory and the astronomical community. Given that that the CADC and other national organisations already perform many of the key functions of a regional centre, we are exploring the implications of hosting a regional centre in Canada. At CASCA 2018 in Victoria, the scope and structure of a Canadian SKA regional centre was one of the main topics of discussion. The primary question we are facing is what kind of services would enable the SKA regional centre to be a facility that supports all of Canadian astronomy. We are planning more community consultation and we will work closely with NRC to define a regional centre plan that matches community needs. The Canadian Initiative for Radio Astronomy Data Analysis (CIRADA) is a newly established consortium of six Canadian universities, funded by a $10.3M grant from the CFI. CIRADA is developing the tools and infrastructure needed to support a Canadian SKA Data Centre, with direct application to the VLA, CHIME and ASKAP, and in close collaboration with CADC, NRAO and other partners. The CIRADA projects has now formally kicked off, and initial use cases are being developed. See CIRADA for more information. Canadian astronomers continue to participate in almost all SKA science working groups. The working groups on transients, pulsars, the Milky Way and the cradle of life are all currently chaired by Canadians (Michael Rupen, Ingrid Stairs, Erik Rosolowsky and Doug Johnstone, respectively). The next SKA science meeting, “New Science enabled by New Technologies in the SKA Era”, will take place at the new SKA Headquarters at Jodrell Bank over April 8-12, 2019; the abstract and registration deadlines are both October 26th, 2018. The SKA Organisation is now undertaking SKA Science Data Challenges. These will be increasingly realistic simulated SKA data products, aimed at preparing the scientific community for extracting science most efficiently from the actual SKA data products as soon as they become available. The first Data Challenge release will be relatively modest in scope, providing simulated continuum image data products for random pointing directions obtained with SKA1-Mid at a small number of centre frequencies. However, this should already allow for testing of source finding and characterisation code that can be compared with the input catalogue for completeness and reliability as well as more specific analysis of relevance to particular Science Working Groups (e.g., recovering source ellipticities with the precision that would be needed for a weak gravitational lensing experiment). The first release for the SKA Data Challenges will soon be made available here. The SKA project maintains 11 international science working groups and another 2 focus groups. Membership of science working groups and focus groups is open to all qualified astronomers. If you are interested in joining one of these groups, please email contact@skatelescope.ca. The Murchison Widefield Array (MWA) is the precursor of SKA-Low and is a powerful science facility in its own right (see MWA for details). MWA phase 2, which improves the sensitivity of the array by an order of magnitude, is now operating. Canada, through the University of Toronto, is a full member of the MWA project, with representation on the MWA Board. Any Canadian astronomers wishing to join the MWA Consortium and to consequently gain access to MWA data, software tools and science collaborations should contact Bryan Gaensler. The Association of Canadian Universities for Research in Astronomy (ACURA) coordinates activities and discussion on the SKA through the ACURA Advisory Council on the SKA (AACS). Current members of AACS are listed here. AACS meets several times per year, with its next meeting in November 2018. For further information or to propose AACS agenda items, please contact the AACS Chair, Bryan Gaensler.